To further the aims of the Guild of Straw Craftsmen it is important that we have a Links page. This page is not an afterthought but an essential part of the web site. Brian Mizon is a thatcher in Cambridge whose father used to supply wheat to Minnie Lambeth for her to make corn dollies. She also taught Brian's father and there is a picture of his father with some of the work he did. The more astute of you will notice a similarity in the names Mizon and Mizen, there may be a link, but that is a subject for future research. Fred Mizen made a Lion and Unicorn for The Festival of Britain held in 1951. This is from the site of Brian Mizon (see Minnie Lambeth above) whose father repaired some of Fred Mizen's exhibits. On this page there are some previously unpublished pictures. Neil was one of the founder members of the Guild and became our first president. He was well respected in his local community as well as the straw craft fraternity. 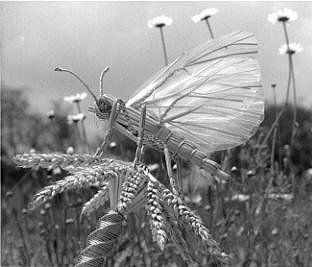 This web site was created to his memory by Colin Westley who lives in Market Weighton where Neil used to teach. Whilst you are here have a look at Colin's web site. The National Association of Wheat Weavers is the US equivalent of the Guild of Straw Craftsmen. Like us it organises an annual convention and produces a newsletter. Swiss Foundation for Straw Craft promotes straw craft in Switzerland through talks, exhibitions, courses, advice on growing straw and tools for straw craft. There are page in French, German and English. This section contains links to all forms of Straw Marquetry including appliqu� and inlay forms. This is straw marquetry on a grand scale. See how Stéphane Diss can transform your rooms. The Revd Marian Paskowicz uses the inlay technique to produce his marquetry pictures. Here he describes how he starts the pictures and the straw he uses. Elda Heidemann is a member of the NAWW. 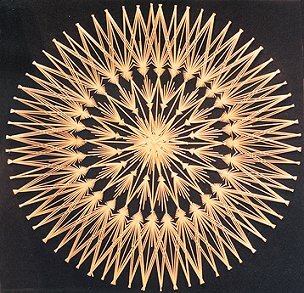 She developed her interest in straw marquetry by doing oil paintings of flower arrangements. The Spanish Colonial Arts Society is a non-profit organisation supporting traditional Hispanic artists. Straw appliqu� is one of their specialities. Straw Stars are very much part of the German Christmas. 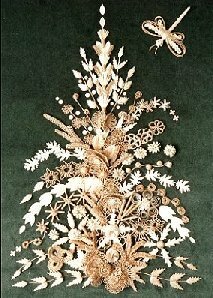 This site by Rolf Dietz (a Guild member) gives a short introduction to Straw Stars, examples, some brief instructions, details of kits for making Straw Stars and an order form for buying all materials needed to make these delightful decorations. If you were not sure what Lip Work is then read all about it at the Ceredigion County Council Museum Collections web site. This site contains fascinating information about rural life from 1850 to 1950. An excellent site containing a potted history of beekeeping and some details of references for further reading. The site was started in 1996 but it has not yet been completed. Keeping bees in skeps by Martin Buckle. 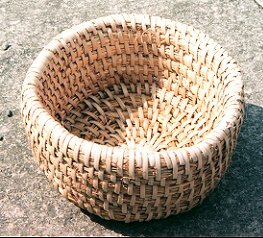 Another excellent site about bee skeps and how to make them. There are lots of interesting photographs and even instructions for splitting brambles to make the binding. Have you ever wondered what a Flemish 16th century chicken basket looks like? He made one at the request of an artist interested in painting of the period and in case you cannot find it click on the "Willow Baskets" link. Orkney Chairmaker Robert Towers has been making these unique items of furniture since 1977. There are photographs and a history of Orkney Chairs plus what to look for in a good chair. Scapa Crafts is a small business run by Jackie and Marlene Miller from their home in Kirkwall. A rather amazing straw figure, a "straw guardian, thought to have magical power, is displayed at the village borders to protect the village from intrusion by evil spirits or dangerous persons". Click on the return icon to link up with the National Museum of Japanese History to "The World of Japanese Folk Customs and Beliefs". The Monday after Twelfth Night (January 6th) is known as Plough Monday. There are many customs associated with Plough Monday but most have died out. One of them involved the local farm workers (pulling a plough) visiting all the houses in the village and demanding money. If no money was forthcoming, or too little, then the plough was put to use creating a furrow through the front garden. 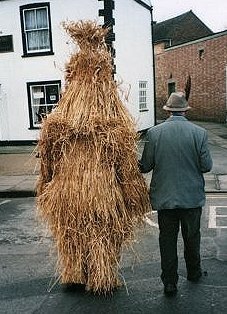 In Cambridgeshire it was the custom to dress one of the ploughmen in straw and call him a Straw Bear. A newspaper report of 1882 reports "he was then taken around the town to entertain by his frantic and clumsy gestures the good folk who had on the previous day subscribed to the rustics a spread of beer, tobacco and beef, etc." The original Straw Bear was last seen in about 1909 and the custom halted, it is said, by a zealous police inspector who regarded it as cadging. The Whittlesea Straw Bear Festival revival started in 1980 and has run every year since. If you are thinking of going to the festival you can get the details from their web page: Whittlesea Straw Bear Festival. We have been told that "Whittlesea is at the West edge of East Anglia, a good half hours drive from Norfolk!". 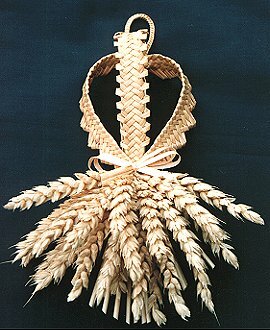 Crying the Neck was a harvest custom in the counties of Cornwall and Devon associated with cutting the last sheaf. The Straw Boys perform at Irish wedding celebrations (either invited or uninvited and in disguise). The first link gives some background and describes what happens during a visitation of the Straw Boys. The second link describes how one of the Straw Boys' hats is made. The first of these links of The Aughakillymaude Community Mummers from County Fermanagh, Northern Ireland, is about a visit to Cheshire in 2002 where they attended a weekend of Traditional Dance & Drama. Three of the characters (Jack Straw, Big Head and Captain Mummer) in the play wear costumes made of straw. The second link describes the play and costume. 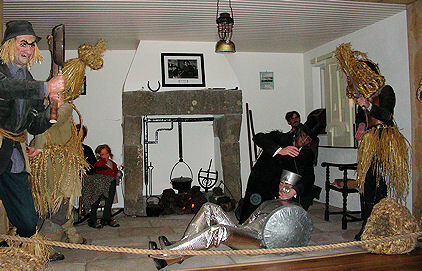 The tableau in the Community Centre showing a scene from the Mummers play. This is what happens if you forget to invite your neighbours to a party. Description of the tradition of the Harvest Wreath or Wieniec as it is known. Graeme Meek and Barry Goodman (known as Life and Times) perform traditional songs & music at folk clubs, festivals and for schools. Their shows for schools are based on history, tradition, music and drama and are suitable for Key Stage 1 to 3 pupils. They are currently doing an item about straw plait in their school show 'Yet More Hats Off To History', they have songs 'Straw Plait' (used in that show) and 'We Used To Plait Straw Here As Well', and they also have a song about the Whittlesey Straw Bear (called 'Follow The Straw Bear') which appears in their current winter show, 'Frost & Rhyme'.